SPPI’s authoritative Monthly CO2 Report shows that in recent years global mean sea level, as measured by the JASON satellite, has not risen for three years, probably in response to ocean cooling. Main points The University of Colorado, at SPPI’s request, has updated the sea-level data from the JASON satellite to the end of 2008. 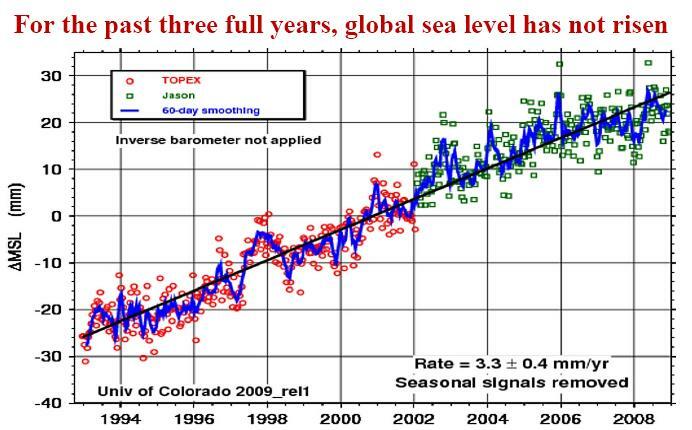 Though James Hansen of NASA says sea level will rise 246 feet, sea level has not risen since the beginning of 2006. Sea level rose just 8 inches in the 20th century and has been rising at just 1 ft/century since 1993. Since Al Gore’s climate movie An Inconvenient Truth was launched in January 2005, global cooling has occurred at the equivalent of 10F (5.5C) per century. If this rapid cooling were to continue, the Earth would be in an Ice Age by 2100. The UN’s climate panel, the IPCC, had projected temperature increases at 4.5 to 9.5F (2.4 to 5.3C) per century, with a central estimate of 7F (3.9C) per century. None of the IPCC’s computer models had predicted a prolonged cooling. The IPCC’s estimates of growth in atmospheric CO2 concentration are excessive. They assume CO2 concentration will rise exponentially from today’s 385 parts per million to reach 730 to 1020 ppm, central estimate 836 ppm, by 2100. However, for seven years, CO2 concentration has been rising in a straight line towards just 575 ppmv by 2100. This alone halves the IPCC’s temperature projections. Sea ice extent in the Arctic recovered to the 30-year average during the early winter of 2008. In the Antarctic, sea ice extent reached a record high late in 2007, and has remained plentiful since. Global sea ice extent shows no trend for 30 years. The Accumulated Cyclone Energy Index is a 24-month running sum of monthly energy levels in all hurricanes, typhoons and tropical cyclones. 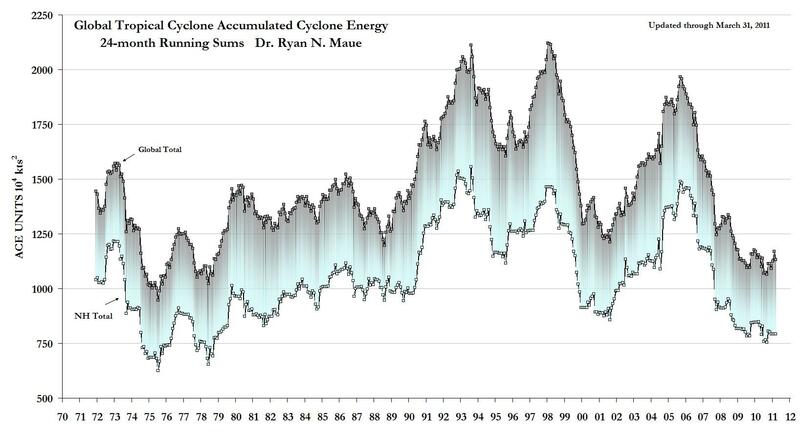 The Accumulated Cyclone Energy Index hit a 30-year low in October 2008. Read the full SPPI Monthly CO2 Report including a debunking of railroad engineer IPCC chief Pachauri claims here.